Comic Book Archie: The classic, all-american teen, Archie has been the star of his self-titled comics since the 1940s. The redhead, an only child, has mostly served as a bit of a blank slate over the years, but at his core Archie has always been a bright-eyed, optimistic teen who’s a bit of a clumsy goofball, but always has his heart in the right place… except for maybe when it came to chasing after the women in his life. Aside from the eternal love-triangle Archie finds himself in between his best friends Betty and Veronica, Archie is a keen athlete (although his clumsiness often keeps him on the bench for Riverdale High’s various sports teams), an avid mechanic for his beloved jalopy—originally an actual Ford Model T he drove for decades, but eventually replaced with a ‘60s-era Ford Mustang—and the lead singer and guitarist of “The Archies,” a small-time band formed with his closest friends that plays infrequent gigs throughout the town of Riverdale. 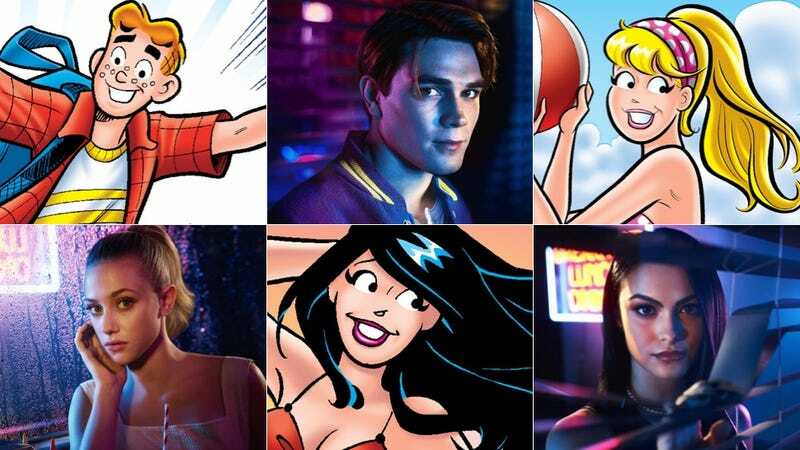 Despite spinoff series where Archie and his pals were re-imagined as spies, superheroes, or Scooby Doo-esque mystery solving teens over the years, the dominant drama in Archie’s life over the years has always been his romantic entanglements with Betty and Veronica, and his trials and tribulations as he attempts to decide who he loves more. Riverdale Archie: He’s still all-American, still red-headed, still a high school student, and and still an athlete. But the CW Archie comes with some extra angst. This Archie has what we like to call High School Musical syndrome: he’s just too good at too many things. But trying to serve all his masters is tearing him apart. So this Archie tries to write music for Josie and the Pussycats, lies to his football coach about working for his dad, lies to his dad about football, all to get a few minutes to do what he wants. It does not go as planned. He’s also hiding an affair with one of teachers. So one of the world’s most famous love triangles is now a square. Comic Book Betty: Archie’s literal girl next door, Betty’s humble, middle-class upbringing was part of the charm that enamored her to Archie pretty much since the comics began. The uber-nice Betty was frequently seen as an avid lover of animals, a trusted member of the Riverdale community who would help out doing odd ends from everything to babysitting to caring for the elderly, and actively involved in social and environmental issues throughout the town. Aside from being extremely kind, Betty was also often portrayed against the grain of the “dumb blonde” stereotype by being shown as one of the smarter students at Riverdale High. Aside from her on-again, off-again dating life with Archie, Betty has a close relationship with Jughead (who frequently consoles her about her relationship woes with Archie and other boys), and an even closer one with Veronica, despite their “rivalry” for Archie’s affections over the years. Betty might be one of the most important people in Archie’s life, but to her, Veronica is her closest friend, with the two bonding over a love of fashion, shopping, and Archie himself. This Betty finds it really hard to take risks—she’s clearly stopped herself from telling Archie how she feels for a long time. And it takes Veronica showing up for her to begin even the tiniest rebellion against her parents. Comic Book Veronica: If Betty is the down-to-earth, hardworking nice girl in Archie’s life, Veronica is the exact opposite. The daughter of Hiram Lodge, one of the richest men in the world (and easily the richest man in Riverdale), the Lodge family moved to Riverdale in the hopes that a small-town lifestyle might help Veronica grow out of being a spoiled rich kid. It… didn’t exactly work out. It was in that new social circle Veronica met her biggest rival—and eventual best friend—Betty. Although Veronica would be deeply jealous and petty of Betty’s successes (especially if those successes were tied to anything related to Archie), the two ultimately bonded despite their radically different backgrounds and rivalry over Archie. Riverdale Veronica: Riverdale’s Veronica Lodge is mostly new to Riverdale, transferring in from New York. The move came after a scandal with her father—so it seems as if this Veronica won’t have nearly as much cash as her comic book counterpart. 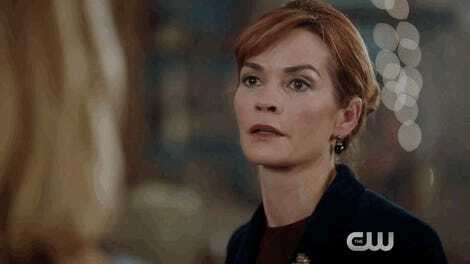 She does seem very city-slick in comparison to the rest of Riverdale’s high school students. Where Cheryl Blossom (more on her below) should be queen, it’s soon apparent that anyone challenging Veronica’s willpower will find themselves out of their depth. For example, she’s the one who gets Betty on the cheerleading squad uniform, with a single, well-placed kiss. She also clearly values her newfound friend Betty over whatever attraction she might feel for Archie. In this iteration their bond is instant, and Archie almost feels like an afterthought. It’s a no-brainer for her to pick Betty over Archie. Comic Book Miss Grundy: One of several teachers at Riverdale High, the elderly Ms. Grundy was often the homeroom teacher for Archie and his friends, a no-nonsense matriarch whose strict approach to teaching often clashed with Archie’s clumsiness and penchant for goofy shenanigans (and even moreso with Jughead’s love of pranks). Despite her strictness, Ms. Grundy cared deeply for her students and pushed them hard, leaving a mutual sense of respect between herself and Archie’s class. And yeah, she totally once flirted with the Punisher during the infamous Archie/Punisher crossover story. Comic Book Jughead: Archie’s very best friend since they were young children, Jughead—real name Forsythe Pendleton Jones III—is a foil to Archie in the vein of Betty and Veronica’s friendship. If Archie is the teamplayer and go-getter, Jughead is the sarcastic, lazy non-conformist, happy to stand out as the “weird kid” and prankster at Riverdale High, and equally happy to remain as far away from the romantic entanglements that caused trouble for Archie and the rest of his friends (a trait that would eventually be canonized in recent comics as Jughead being asexual). Although he’d often disapprove of Archie’s zany antics, he was always portrayed as being extremely loyal. Aside from being Archie’s lifelong best friend, Jughead is known primarily for two things: his whoopee cap, a ‘20s-era fashion statement Jughead has continued to wear long after it went out of style, and his unabashed love of eating. A frequent regular at pretty much every Riverdale eating establishment, Jughead is known for eating vast quantities (a frequent running joke with the character would see him pretty much put any restaurant offering an “all you can eat” buffet out of business) and never putting on weight, despite his incredibly lazy lifestyle. Riverdale Jughead: Say goodbye to best friends forever. There’s a rift between Riverdale’s Archie and Jughead (oh please let it be the high school classic “you got popular!”). This Jughead does stick to the weird, non-conformist label, but in the grand tradition of modern teen shows, he’s now less of a slacker and more of a broody writer-type. In fact, in the pilot, he appears to be writing a story based on the events we’re witnessing. He’s a real loner, but he still hangs out at a diner while he’s writing. Oh, and this Jughead isn’t asexual. At least, not yet, but his actor hopes to make it happen. Comic Book Josie and the Pussycats: The Archies weren’t the only rocking teen band in Riverdale. First introduced in the early ‘60s, Josie and her best friends Melody and Pepper were originally a trio that had their own comic series in the Archie stable. That was followed by She’s Josie, which focused the band’s own adventures and teen tribulations, and their rivalry with the Veronica-esque Alexandra Cabot. By the end of the ‘60s, the series was reworked into Josie and the Pussycats, which saw Josie and Melody start their own band (and team up with new character Valerie, the band’s bassist). Pepper was phased out of the series, and unlike The Archies, the Pussycats became a smash hit beyond the confines of Riverdale, touring the world to play their music, while occasionally heading back to Riverdale for a side of teenage drama. Riverdale Josie and the Pussycats: They’re pretty much still the best band in town, but now they’ve got ambitions. And Josie’s got a pretty strong perspective on who she is, who the band is, and how authentic they need to be. And she also has no time for Archie’s musical aspirations. Josie and the Pussycats are determined to stay on top of the Riverdale music scene, despite that not being the most incredible achievement in the world. Comic Book Cheryl: Originally introduced and rapidly cut from the comics being too sexual for Archie’s wholesome image, Cheryl became a prominent supporting character in the Archie universe in the mid-‘90s. Originally hailing from the nearby rival town of Pembrooke, Cheryl and her twin brother Jason (more on him in a bit) eventually moved to Riverdale, with Cheryl becoming somewhat of a third wheel in Archie’s ongoing love woes with Betty and Veronica. Like Veronica, Cheryl is relatively well off (although not on the level of Veronica’s wealth), and Pembrooke’s uppity rivalry with the “townies” of Riverdale often played into her snooty attitude—an attitude that, unlike Veronica’s, rarely softened. Although occasionally portrayed as a friend of Betty and Veronica, she was often seen trying to manipulate the two to pull them away from Archie, so she could move in on him for herself. Riverdale Cheryl: She’s actually the closest to her comic book counterpart, except this Cheryl doesn’t move to Riverdale. She’s already there as the reigning Queen Bee when Veronica shows up to challenge her place on the throne. She doesn’t seem interested in Archie as the prize of her Betty/Veronica manipulation; she just likes the power involved in pitting the girls against each other. Of course, she’s also got a tragic backstory this time around. Which brings us to her twin brother. Comic Book Jason: Cheryl’s twin brother Jason was, like his sister, an arrogant and snooty student at Pembrooke Academy (and later Riverdale High, when his family moved). As Cheryl was to Betty and Veronica, Jason was to Archie, and often portrayed as a potential rival for Betty or Veronica’s affection—mainly Betty’s—in the original Archie comics. Riverdale Jason: In Riverdale, Jason is a corpse. Riverdale wants to make “who killed Jason Blossom” as much of a thing as “who killed Laura Palmer” was for Twin Peaks. I expect we’ll learn all sorts of secret and unsavory things about the dead Jason.